Though it was demolished 90 years ago, Devonshire House was one of London’s most fabulous aristocratic homes for a couple of centuries. One of the things that set it — and a handful of other aristocratic homes — apart from typical town homes of the nobility was the plot of land that surrounded it. While many of London’s grandest houses were terraced (what Americans might refer to as “row houses”), Devonshire House sat on three choice acres on Piccadilly, with a view of Green Park from the front and a view to the garden of Berkeley Square from the rear (across the gardens of Landsdowne House). 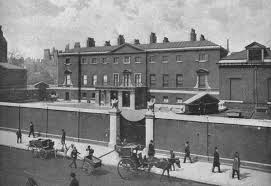 As with Melbourne House (now Albany), Burlington House, and Landsdowne House (all significantly altered), Devonshire House was entered through gates large enough for a carriage to pass, and gardens and outbuildings were located within the walls. Home to the Dukes of Devonshire, the Palladian house was completed in 1740 for the 3rd Duke, with William Kent serving as architect. This structure replaced the former Berkeley House, which burned. Berkeley House, bordered by Piccadilly and Berkeley Street, had been built in 1665-1673 by Lord Berkley and was later the residence of Charles II’s mistress, Barbara Villiers before the 1st Duke of Devonshire bought the classical mansion. Though the exterior of Kent’s Devonshire House was plain, the interiors were said to be sumptuous, with a 40-foot long library the highlight of the three-story house. It also housed what was said to be the finest art collection in England. Many of these paintings can now be found at the current duke’s opulent country house, Chatsworth House. Devonshire House was famed in the late 18th century as the nucleus of Whig politics, presided over by the duchess Georgiana, wife to the 5th duke. A hundred years later a grand dress ball to celebrate Queen Victoria’s diamond jubilee was held there. Also during Victorian times, the house was altered by James Wyatt, who was one of the most fashionable architects in the late 19th century. 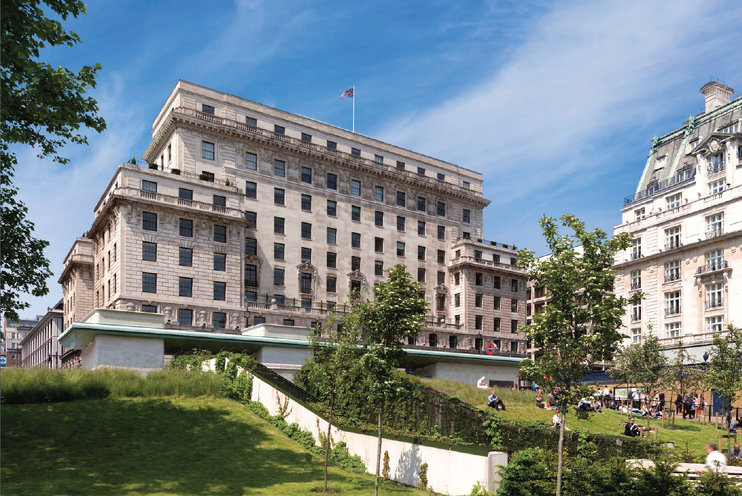 Large white building replaced Devonshire House in the 1920s; French building at right is Ritz; white, flat building in foreground is for London Underground. Taken from Green Park. Following World War I, Devonshire House was abandoned in 1919 as the 9th Duke was the first to be required to pay high death duties. These amounted to £500,000 (approximately $16 million today). The 9th duke sold off much of his fine library, including a Caxton and many first editions of Shakespeare. In 1921, he sold Devonshire House and its three-acre garden for $750,000. The house was demolished in 1924, and an office building–also called Devonshire House–now stands on the site–Cheryl Bolen. See http://www.CherylBolen.com for more articles. 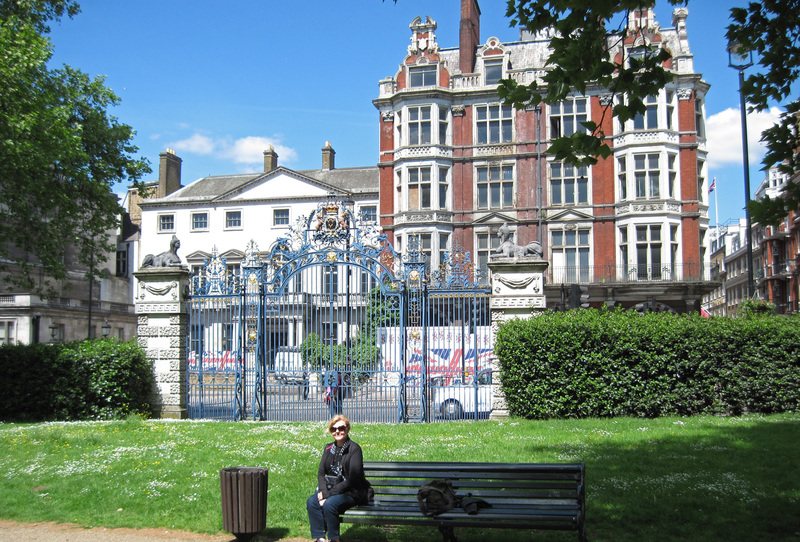 This entry was posted in Uncategorized and tagged Devonshire House, Georgian architecture, Georgiana Duchess of Devonshire, Green Park, William Kent by Cheryl Bolen. Bookmark the permalink. I really enjoyed your pictures–the gate is beautiful. The office building–not so much–but there’s always interest in knowing what is on the sight today. Devonshire House is a favorite of mine.